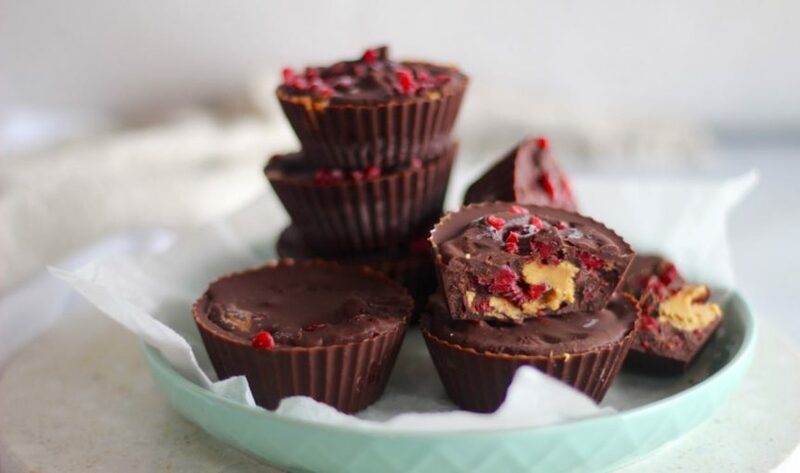 Choc raspberry peanut butter cups | Delish healthy recipe! Yes, you read it right, choc raspberry peanut butter cups. And they are all kinds of epic yum. But the best bit is that we didn’t even make them! Our friend Amber did. Yay for us and yay for you, because you scored the recipe. This recipe wins because peanut butter and chocolate is the most mind-blowing food combo. Then raspberry and chocolate is an equally as mind-blowing food combo. So what happens when you add chocolate, raspberry and peanut butter? It’s a freaking taste sensation, party in your mouth kinda thing. 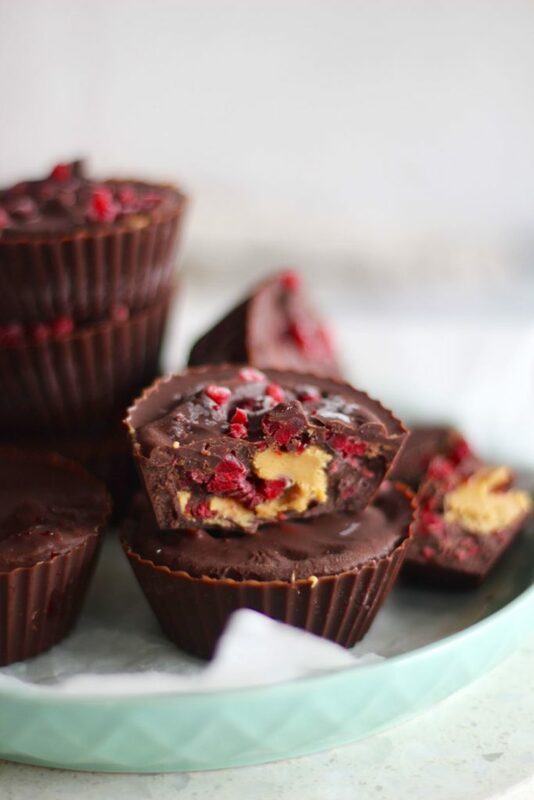 We highly recommend you make these choc raspberry peanut butter cups! In a saucepan on medium heat, place the coconut oil, peanut butter, cacao, xylitol, cinnamon, vanilla and salt. With a whisk, continuously stir until melted, combined and smooth. Pour the mix into silicon moulds, place extra dollops of peanut butter in the centre of each chocolate and sprinkle with chopped raspberries. Place into the freezer for 30 minutes or until set. Carefully turn out and NOM NOM NOM! Store in the freezer in an airtight container and don't eat them all at once! Hehe! Don't like peanut butter? Swap to almond or cashew butter! Just as yum!